Paulina, Olya, Anastasia, Natasha. When Nick Kosciuk hears the children’s stories, they always touch his heart—their mothers and fathers abandoned them in orphanages in Belarus, a republic near Russia, to be raised by strangers. The California painter recently returned from his 12th trip to Belarus in four years, bringing back with him not only the tales of orphans from this far-off land but also 2,000 photographs that will serve as reference material for his hauntingly beautiful portraits. Faces of the Belarusian children stare out from Kosciuk’s starkly dramatic canvases, evoking a sense of mystery and the feeling that they have something compelling to say. Some have halos circling their heads, giving them an angelic countenance. Others wrap their arms around each other as if for support. All of their gazes are solemn and serene, innocent but knowing. One day in December, Kosciuk reflects on his recent trip to Belarus from his studio at home in Cambria, a coastal town in central California. In his left hand, he holds a photograph of one of the children, 11-year-old Olya. In his right hand, he wields a paintbrush, with which he is re-creating the young girl’s likeness. Olya’s mother had kicked her out of the house and told the girl that she was no longer her daughter, Kosciuk recalls. “She told me the story with a smile on her face,” he says, noting that the children talk about their parents’ neglect and, frequently, alcoholism with the same casualness that children in America talk about their parents’ jobs. The Republic of Belarus is a landlocked nation-state in Eastern Europe that officially declared its independence in 1991 following the collapse of the Soviet Union. Because of allegations of human-rights violations, among other issues, the country has been excluded from joining the Council of Europe, an organization of more than 40 member states with the mission of facilitating economic and social progress. After returning from each trip to Belarus, Kosciuk buries himself in his studio and paints with a near-religious fervor, creating a new series of works spotlighting the orphans. 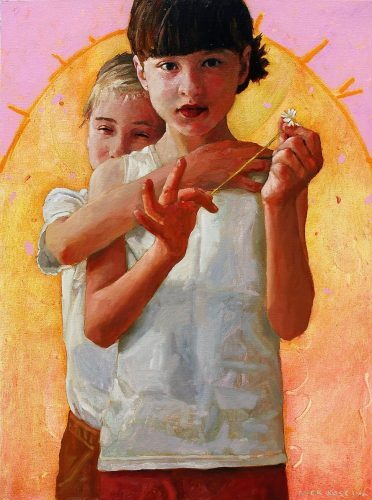 When each series is completed, the portraits are exhibited at The Vault Gallery in Cambria. Soon after, Kosciuk boards a plane for Belarus and begins the cycle anew. He takes with him a generous portion of the proceeds from art sales and donates it to several orphanages. He gives with no strings attached. “I’m not trying to change them, convert them, or tell them how to spend the money,” he says. When Kosciuk arrives in Belarus, he usually spends about six weeks with the children, doing everything from playing silly games to taking walks to buy ice cream. And he snaps thousands of photographs with his digital camera. The younger children vie for face time, he says. Taking their photographs gives them time and attention, a very basic need for children. “The tiniest things seem to make such a huge difference in their lives,” Kosciuk says. But why these children? Why does he travel halfway around the globe to find subjects to paint and institutions to which he donates his money? To understand how Kosciuk became so involved in this effort, it’s necessary to go back in time, first a few years and then to an era before he was born. In 2001, he was at a low point in his personal life, the artist recalls. His parents asked him to accompany them on a trip to Belarus to explore the family’s roots. Kosciuk’s father was born there, and his mother, who was born in a German labor camp after World War II, is also Belarusian. They emigrated to the United States in 1950, married, and settled in South River, NJ, home to a tight-knit Belarusian community. His parents worked hard—his father in a factory and his mother as a waitress and maid. As a child, Kosciuk wasn’t too interested in his ethnic identity. “I just wanted to be an American,” he recalls. That would soon change. Once Kosciuk and his parents arrived in Belarus, the stories he had heard as a child from his grandparents came alive for the first time. He met distant relatives and visited the site where his grandparents’ house stood before it was burned to the ground during World War II. He also retraced some of the steps the family took when they fled the country—his grandfather was ordered to the Russian front and refused to fight because he believed “Stalin was more evil than Hitler.” Kosciuk saw the road his grandparents traveled to escape, reliving their tales of how Russian soldiers pursued them and how they eventually were declared political refugees and transported to German labor camps. By the time this story is published, Kosciuk will be flying back to Belarus, visiting the orphanages once again. Since his fateful trip in 2001, his life keeps getting better and better, the artist says. Among other things, his personal life has taken a surprising turn. During one of his trips in 2004 he met a woman named Tatiana, and they plan to marry in early 2006.